Step back in time for a magical ride through the redwoods on the world-famous Skunk Train. Since 1885 the historic Skunk has made its way through old-growth redwood groves, over scenic trestle bridges, through spectacular tunnels, and into the heart of the Noyo River Estuary. Today’s riders enjoy the same pristine views that have remained largely unchanged for well over a century. A scenic 7-mile roundtrip along the beautiful Pudding Creek Estuary out of Fort Bragg to Glen Blair Junction. From the Willits' Valley Floor, through a historic tunnel, and into the redwood-thick Noyo River Canyon. Two Beautiful Routes. Five Historic Trains. 134 Years. One Amazing Skunk. 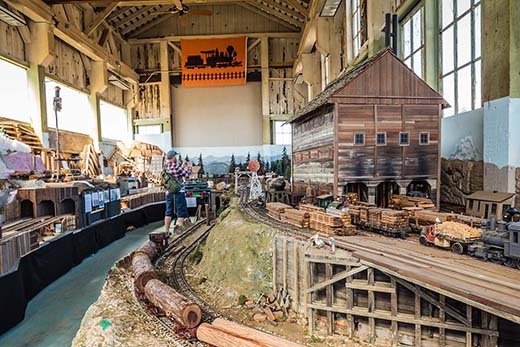 Included with your ticket out of Fort Bragg is entry to our model railroad barn, where you can see rail history firsthand. Experience a relaxing ride on our two-person Railbikes. Discover the redwoods like never before as you cycle peacefully beneath them. Our Railbikes run seasonally from spring through fall. Journey Through the Redwoods on this Unique Railbike Experience. The Magical Christmas Train runs through the month of December, and you and your family can experience the beauty of this history train – and meet Santa! Journey on our historic train to a Pumpkin Patch deep in the redwoods, where you can choose your own pumpkin! Throughout the year we have fantastic fun on the rails, with delicious food, specialty drinks, and more! Since 1885 the Skunk has run through the redwood forests of Northern California, giving generations the experience of a lifetime.